Following the success of the 2016 festival, Research without Borders expanded in both length and scope. 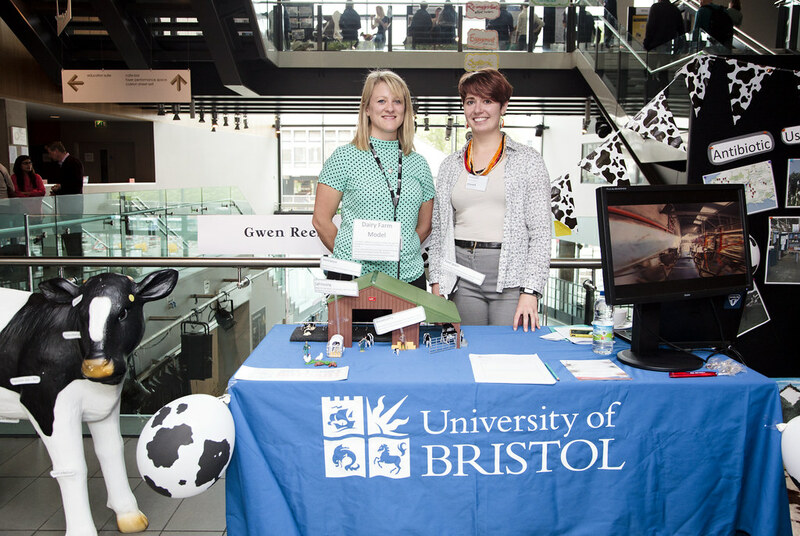 The 2017 festival lasted five days rather than one, and the afternoon showcase exhibition — held for the first time at Colston Hall — was accompanied by both an evening discussion series and the finals of the Three Minute Thesis (3MT®) competition. In collaboration with the University Research Institutes, 16 postgraduate researchers presented their work at a series of evening discussions. Find out more through our Storify. The 2017 festival saw 74 postgraduate researchers showcase their work through interactive displays, activities and exhibits. The finals of the University of Bristol's Three Minute Thesis (3MT®) competition saw eight research students explain their work and its impact in just 180 seconds. Watch the presentations on our YouTube playlist. Take a look at the Research without Borders 2017 programme (PDF, 1,605kB). Hover over the image below to scroll through the gallery from 2017's showcase afternoon on 12 May at Colston Hall. Click on any image to find out more about that entry on Flickr.com.